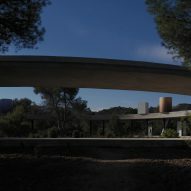 Threading between trees in a Spanish forest, this ring-shaped residence is the second completed Solo House, a series of dream holiday homes designed by leading architects for French developer Christian Bourdais. Brussels-based Office Kersten Geers David Van Severen designed the property for the development in the mountainous region of Matarraña, where Bourdais is planning to eventually build 15 houses and a hotel for the Solo Houses project. 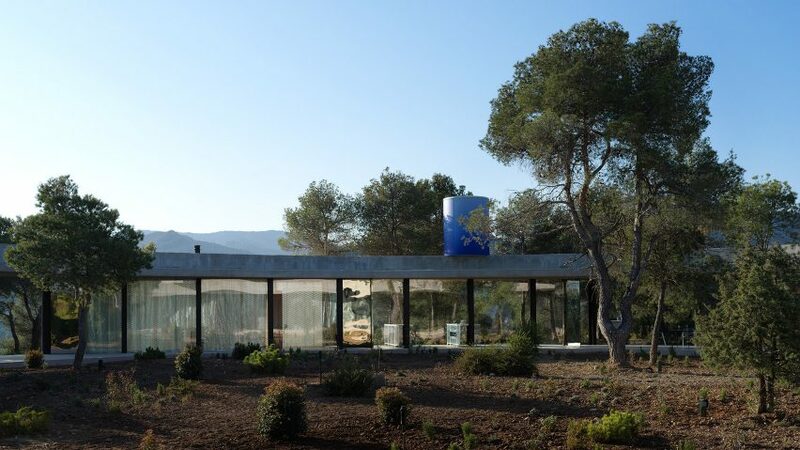 The first of the Solo Houses to be completed was a symmetrical concrete residence by Chilean studio Pezo Von Ellrichshausen, while other planned buildings include a house encased in a lattice of giant sticks by Sou Fujimoto and a building based on the form of an explosion by Didier Faustino. The house designed by the Belgian firm occupies a plot on top of a plateau, which provides a panoramic view of the surrounding forest and landscape. "Since the scenery is so impressive, we felt architecture should be invisible, merely emphasising the natural qualities of the surroundings," said the architects. "A simple circular roof with a diameter of 45 metres underlines the qualities of both the plateau and its edge." 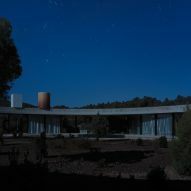 The building's circular roof is supported by four rows of eight columns that intersect with the circumference of the circle at various points. The columns are anchored by concrete foundations and three of the four sections formed by the straight and curved edges enclose the living areas. 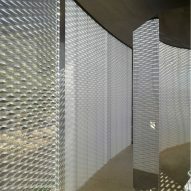 The outer portions of the circle incorporate sliding facade sections made from expanded metal mesh that provide dappled shade and privacy when closed. These can be drawn aside to completely open up the rooms to the outdoors. 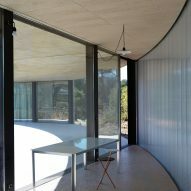 The remaining spaces beneath the curving roof are left open to the elements. These terraces look out towards the landscape, which extends into the space at the centre of the building. In total, the 1,600-square-metre footprint incorporates 1,050 square metres of patio space and a swimming pool. The internal areas accommodate the living room, master bedroom and guest bedroom, which each measure 60 square metres. 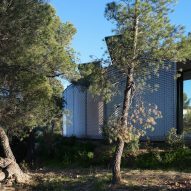 The off-grid dwelling relies on solar panels for heating and electricity, while water is collected and purified on site by tanks and a filtration system on the building's roof. Artist Pieter Vermeersch applied a gradient in acrylic paint to the two cylindrical volumes that emerge from the roof to accommodate the utilites. Belgian studio Muller Van Severen was asked to design curving loungers made from wire mesh for use in the house, while hybrid stool-lamps by Brussels-based artist Richard Venlet add further artistic details to the interior spaces. Photography is by Bas Princen.